In August 1943, Thomas A. Aurelio stood at the threshold of a dream. He was about to be elected to a seat on the Supreme Court for the State of New York. Aurelio, only 48 years old, was a native New Yorker who grew up on the city’s East Side. Educated in the public school system he went to college at New York University where he earned a law degree. His education was interrupted by World War I as he served in Company F of the 51st Infantry Regiment. After the armistice, he taught American soldiers commercial law in a military school in Germany. Returning home, Aurelio was admitted to the bar. In 1922, he was appointed assistant district attorney at the age of 27. Aurelio was appointed judge by Mayor Jimmy Walker in 1931 and four years later he was re-appointed by Mayor Fiorello La Guardia. During a glowing swearing in ceremony La Guardia stated, “I have re-appointed you because I know of your record, and have known you as a boy and a law student. You are the kind of career man I want on the bench.” A review of Aurelio’s record as a judge showed his strong support of the police when their efforts brought them into conflict with big name criminals. In 1931, Aurelio married Aida Pardi and the couple had two children. Aida had long been active in social work and was elected Tammany co-leader of the Eighth Assembly District in December 1939. Gangster Backed Aurelio For Bench! Aurelio: Good morning, Francesco. How are you, and thanks for everything. Costello: Congratulations. It went over perfect. When I tell you something’s in the bag, you can rest assured. Well, we will have to get together, you, your Mrs. and myself, and have dinner some night soon. Aurelio: That would be fine, but right now I want to assure you of my loyalty for all you have done. It’s undying. The revelations forced both political parties to try to remove Aurelio from the ticket, but it was too late. The next choice was to select another candidate and run him as an independent with the support of both parties, or support a proposed candidate from the American Labor Party. The problem with the first choice was the filing deadline for an independent candidate; this required 5,000 signatures and was due to expire at midnight August 31. Disbarment proceedings were quickly brought against Aurelio. During testimony before referee Charles B. Sears, Aurelio was asked to explain his “undying loyalty” comment. “That’s just the way some Italians express things,” he replied. On October 30, 1943 Sears ruled that there was insufficient evidence to prove that Aurelio knew the reputation of Costello. Three days later, Aurelio won the election by almost 50,000 votes over Matthew M. Levy, the candidate of the American Labor Party, which the Democratic machine had fully supported. Several years into Aurelio’s term, Wolf was called to Costello’s apartment where he was shown a $7,500 note payable to Costello and signed by Aurelio in 1943. He demanded that Wolf take it to Aurelio and collect the money. Wolf suggested that he forget about it. When Wolf presented the note to Aurelio, the judge exploded, “Tell that gangster if he ever gets near my court I’ll have him thrown in jail and buried there. I paid that money back years ago.” Wolf returned with the message from Aurelio. Although Costello was furious he did not object to Wolf destroying the note at this point. 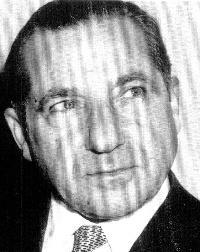 Aurelio was still a sitting judge on the New York State Supreme Court bench when he died in 1973 at the age of 81. Many people agreed, even District Attorney Hogan, that he was an excellent judge. As for Costello, he had moved about his career doing everything possible to keep a low profile. Prior to the Aurelio affair, his name had not appeared on the front page of the newspaper since January 1927. From this moment on his silent days as a behind-the-scenes-power were gone and he would never be out of the public spotlight again.